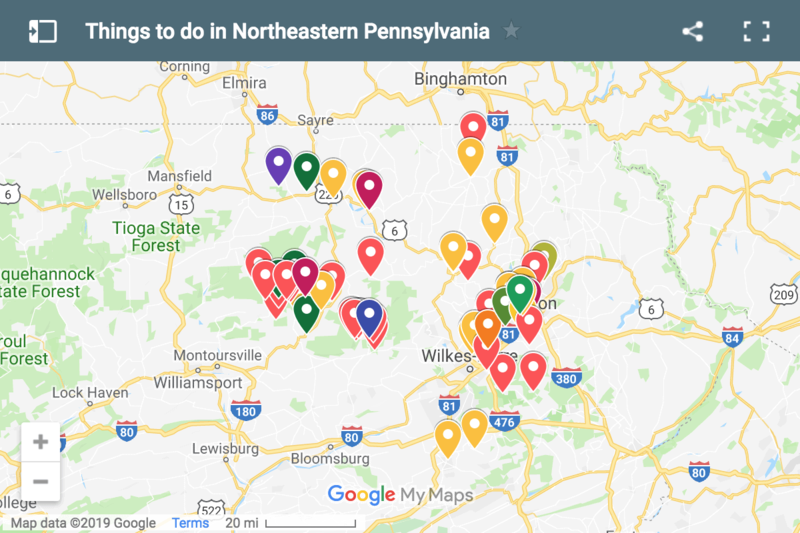 Pinchot State Forest, formally known as Lackawanna State Forest, occupies nearly 45,000 acres of land, primarily in Lackawanna and Luzerne Counties. With this much land, there are bound to be many hidden gems. One of these is Rattlesnake Falls. 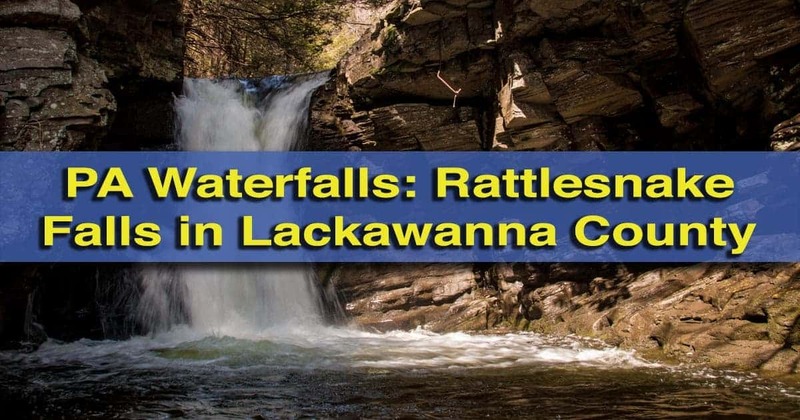 Rattlesnake Falls is located in Spring Brook Township in southern Lackawanna County. 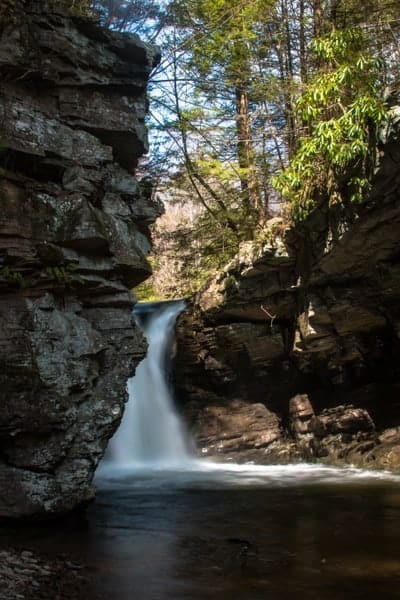 The land surrounding this beautiful waterfall was purchased by the state in the last few years and is now part of the Montage Mountain Tract of the forest. It’s great that such a beautiful site can be preserved for everyone to enjoy. The main drop of Rattlesnake Falls. 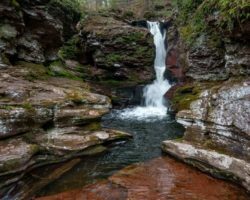 The hike to Rattlesnake Falls is an easy half-mile walk, primarily along an old forest road, from Route 502. Along the way, there are nice views of Nesbitt Reservoir, though these may be somewhat obscured during the summer months. 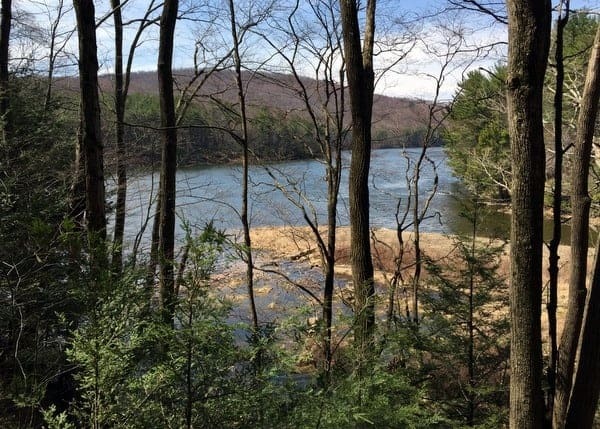 While it might look inviting, note that the reservoir is the source of drinking water for 75,000 people and is not located in the state forest land, so don’t leave the trail to get a closer look. Looking through the trees down at Nesbitt Reservoir. The trail winds its way through the forest just above the southern end of the reservoir. While several side trails come into the main trail, keep walking straight along this trail. After about 10 minutes, the trail will veer to the right at Rattlesnake Creek. Do not cross the creek, instead turn right with the trail to head upstream. 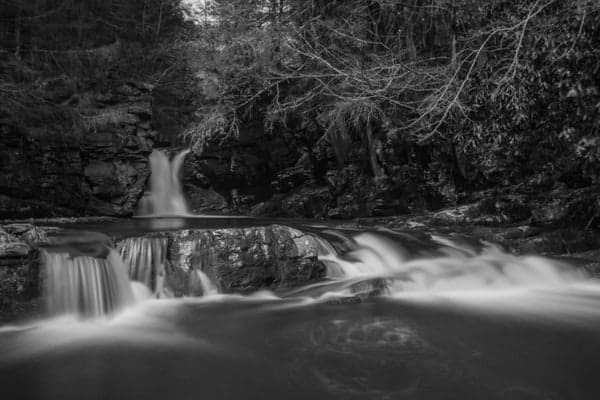 In just a few hundred yards, you’ll come to the top of Rattlesnake Falls. Rattlesnake Creek above Rattlesnake Falls. 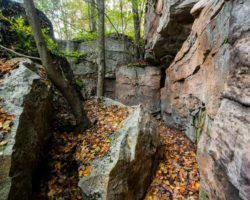 Rattlesnake Falls has carved out a unique gorge. The main falls is about 12-15 feet in height. 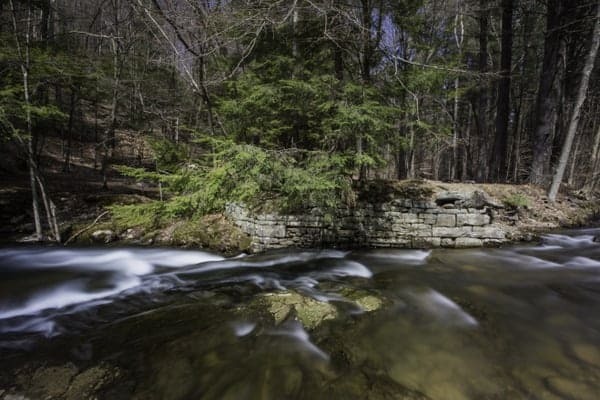 A few yards downstream is a second drop of roughly three feet. In many ways, it reminded me of a more narrow version of Hawk Falls in Hickory Run State Park. Getting a close look at the main drop can be a bit of a challenge without getting your feet wet, but it’s still a great waterfall to enjoy from the banks before the lower drop. The two drops that make up Rattlesnake Falls. 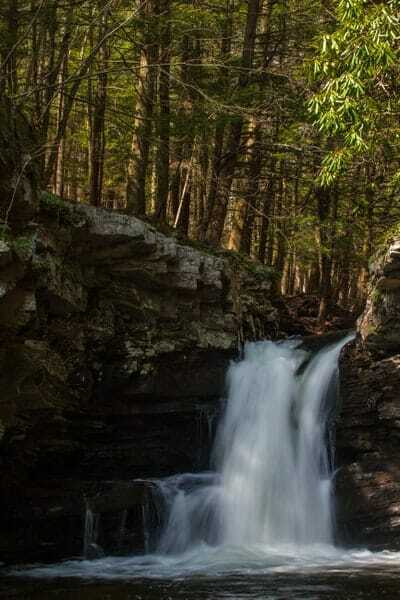 Make sure you also check out the area above Rattlesnake Falls. Here, Rattlesnake Creek make a few small drops through a narrow channel cut into the rock. It’s an incredibly beautiful area that makes a perfect spot for resting for a few minutes. Just above the falls, Rattlesnake Creek has cut a beautiful path through the rocks. 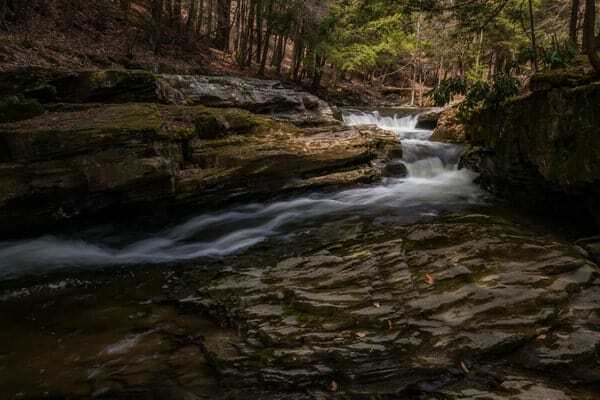 Rattlesnake Falls is a great hidden gem in Lackawanna County’s Pinchot State Forest. It’s easy to reach, while still feeling quite secluded. 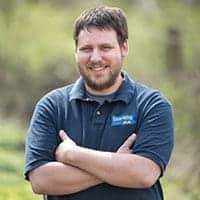 This is a great choice for those looking to explore a peaceful landscape and beautiful waterfall in northeastern Pennsylvania. 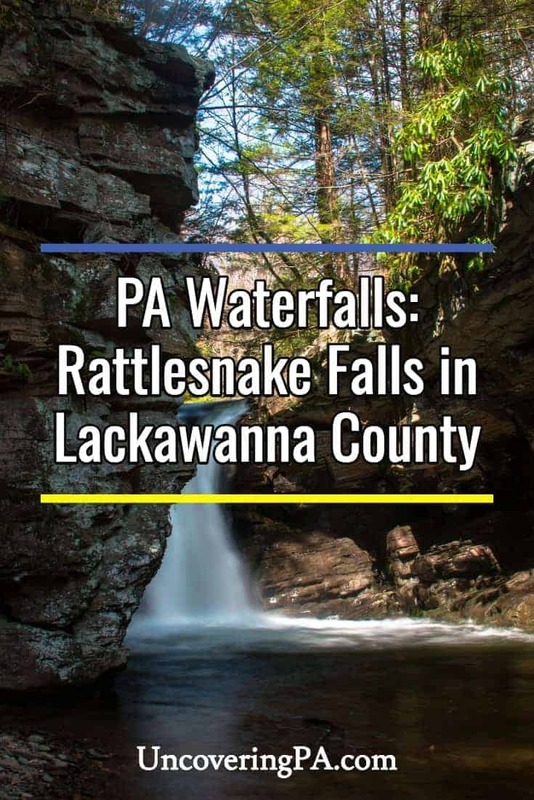 Rattlesnake Falls in located near Nesbitt Reservoir in southern Lackawanna County, Pennsylvania. 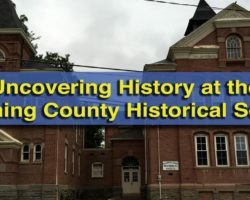 Parking is located along Route 502, just south of the bridge over where Spring Brook opens into the lake. There are no official parking areas here, so just look for a space wide enough to accommodate your vehicle. When parking, use extreme caution as you will be right alongside this busy road. The hike starts from a yellow gate that blocks an old forest road. The trailhead and parking area can be found at the following coordinates: 41.310124, -75.640540. 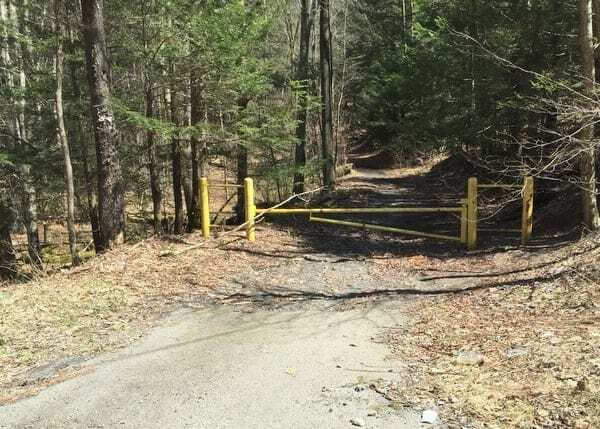 This yellow gate marks the trailhead for Rattlesnake Falls. Walk past the gate and follow the old forest road for 10 minutes. In times of high water, there may be a bit of water on the trail and a small stream to cross. After 10 minutes, you’ll reach Rattlesnake Creek. The path will curve right to follow the creek a short distance upstream to the waterfall. Rattlesnake Falls can be found at the following coordinates: 41.316134, -75.635895. 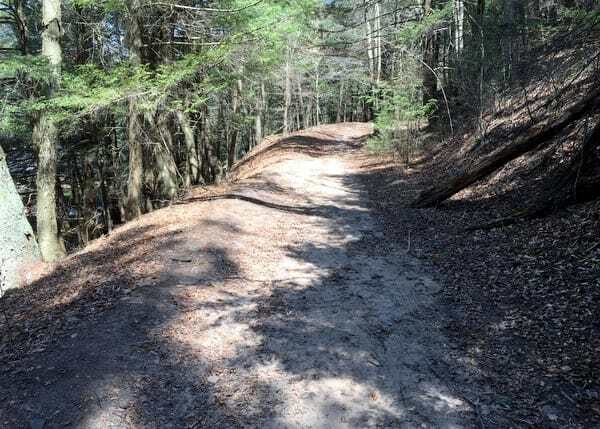 The hike to Rattlesnake Falls is along this wide old roadway. To return to your car, simply retrace your steps. Again, use caution around the roadway. 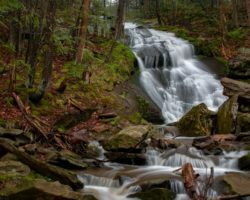 If you want to see more nearby waterfalls after your visit to Rattlesnake Falls, check out Choke Creek Falls, Seven Tubs, and Buttermilk Falls.